I contributed a presentation on Parade to Digital transformations, a research project that explores how cultural organisations contribute to new environments. Environments in which communities of participants interact to create, curate, organise and support their own cultural experiences. On Friday 30th September and Saturday 1st October 2011, I participated in Media Squares: on the new forms of protests and their media, organised by De Baile, in Amsterdam. 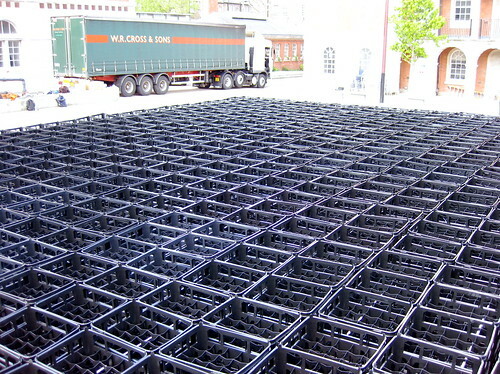 And two weeks later joined the Occupy London protest. Social protest has become almost inseparably linked to a plethora of media images and messages distributed via internet, mobile phones, social media, internet video platforms and of course traditional media outlets such as newspapers, radio and television. A popular category to have emerged recently is the 'twitter-revolution'. In almost all cases - Iran, Tunisia, Egypt, and London - the role of the platform turned out to be less influential in retrospect, although certainly, deeply rooted blogger-networks did play a mayor role, preparing the protests that have now been dubbed the Arab Spring. And digital connectivity played a crucial role in the organisation and co-ordination of the European 'anti-austerity' protests in Spain, Greece, UK and Italy where protest was manifest on the streets and particularly in public squares. One contemporary experience that has clearly caused great changes in the social, political and cultural contexts is the practice of building tools and computer technologies based on open source. A mechanism based on the sharing of results and processes, where the achievements of a group or an individual are also starting points for others. A succession of connected elements mixing creativity, skills and material production, built and consumed through a shared experience. One element allowing the generation of content, based on collective experience, is the wiki. A wiki is a website which allows creating and editing any number of web pages connected to each other, sharing a common language and allowing access to a control group. From this perspective, the construction of tools, tactics and collective practices applied in the context of the city, will be the subject to be discussed in the forum and project workshops in this edition of Quam 2011. Wikpolis translates the possibility of meeting and proposing projects focusing on this option of the node to the context of space and the policies that regulate it, providing with the opportunity to create new shared strategies for modifying social and cultural context. I contribute to Critical Practice, a cluster of artists, researchers and academics hosted by the CCW Graduate School at Chelsea College of Art and Design. We have a longstanding interest in art, public goods, spaces, services and knowledge, and a track record of producing original, participatory events. In a bespoke, temporary structure designed by award-winning architects we produced PARADE a programme of events that explored the diverse, contested and vital conceptions of being in public. 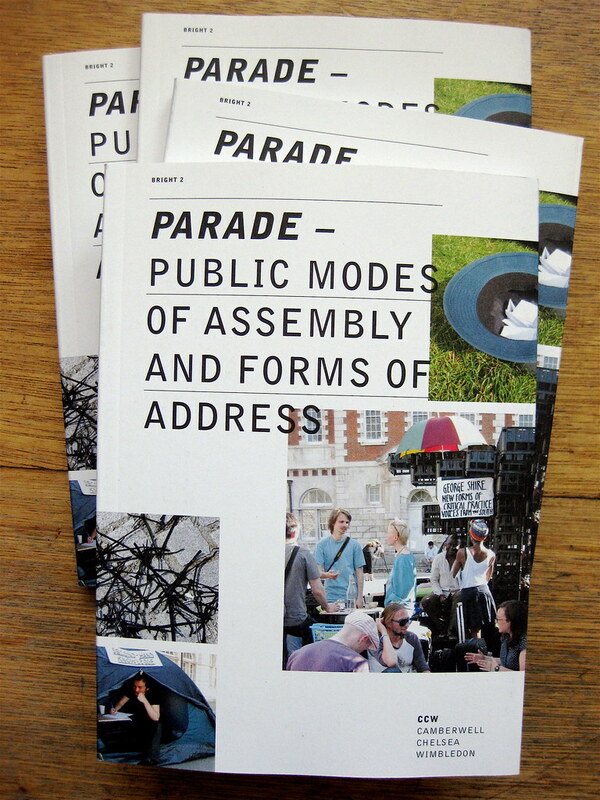 PARADE was so successful we were able to produce a legacy publication, the book will be launched on Thursday 3rd March at 5.30 pm with a conversation about public protest with Joseph Heatcott, in the lecture theatre at Chelsea College of Art and Design. Maybe see you there? With other leading academics, artists, curators and writers I contributed to a symposium coorganised by Lanchester Gallery Projects and the Herbert Art Gallery in Coventry. What is to be Done? explored events at Coventry School of Art and Design 1968-72 and the wider counter culture context of the 70s. It examined radical regional art education and its legacy, particularly in relation to contemporary experimental institutional and pedagogical practice. The event coincides with a retrospective of the work of David Rushton, founder editor of Coventry-based Analytical Art in the 1960s and Art & Language member from 1972 to 1975. I talked about the work I do as part of Critical Practice, and especially the Parade project. I contribute to Critical Practice and following Parade we have been invited to participate in El Ranchito. We went to Madrid to begin to research the context for the invitation. El Ranchito is a cultural experiment launched at the Matadero in the city of Madrid. I contribute to Critical Practice, a cluster of artists, researchers and academics hosted by Chelsea College of Art and Design, a constituent college of the University of the Arts London. We have a longstanding interest in art, public goods, spaces, services and knowledge, and a track record of producing original, participatory events. Chelsea College of Art and Design has a large contemporary courtyard at its heart: the beautiful Rootstein Hopkins Parade Ground. We collaborated with Polish curator Kuba Szreder to develop a programme of events that explore the diverse, contested and vital conceptions of being in public. In a bespoke, temporary structure designed by award-winning Polish architects Ola Wasilkowska and Michał Piasecki - assembled in public - we produced a landmark event in an amazing location with a host of international contributors. Parade challenged the lazy, institutionalised model of knowledge transfer - in which amplified 'experts' speak at a passive audience. Our modes of assembly, our forms of address and the knowledge we share are intimately bound. I will be participating in a Public Body Barcamp. On Saturday 17th October at 14:00 at the Nowy Wspanialy Świat, Ul. Nowy Świat 63, Warsaw, Poland. Jointly facilitated by Critical Practice - a cluster of artists, researchers, academics and others hosted by Chelsea College of Art & Design, London - and Free/Slow University Warsaw - a nomadic centre of interdisciplinary studies, critical reflection, and independent thinking about art and society - the Public Body Barcamp is an extension of Publicamp. The assembly will be concerned with notions of being-in-public, and aims to explore ideas about the public body. The Public Body Barcamp aims to examine the relationships among singular and assembled bodies, what infrastructures are necessary to facilitate a public body, public knowledge, art, social practice and fields of action in public space.